I don't know about all of you, but I am dreaming of Spring today. I love the Winter so very much, don't get me wrong, but there is something about the change of a season, especially Spring, that makes me feel inspired and rejuvenated. 1. Open Windows-There really isn't anything better than opening up your windows after a long winter. 2. Flowers-Being able to stop and smell the roses is an amazing thing. 3.The Rain-Spring rainstorms really are the best. 4. The Sun-Need I say more? 5. A Spring Breeze-When you can hear the new leaves on the trees and feel the wind in your hair...Spring is officially here. I get motivated to write, work, and clean when Spring arrives. As well as be outside a whole lot more! 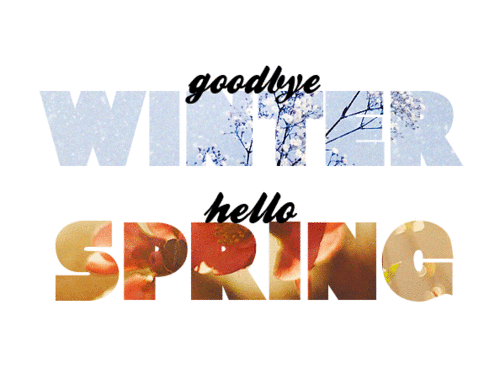 What are you looking forward to when Spring gets here?